Plenty of comics deal with religion, including the pop-star cosmology of The Wicked + The Divine, the apocalyptic prophecies of East of West, the blasphemous absurdity of Battle Pope, the pagan slaughter of the “God Butcher/Godbomb” storyline in Thor: God of Thunder and the John Wayne-flavored sacrilege of Preacher. 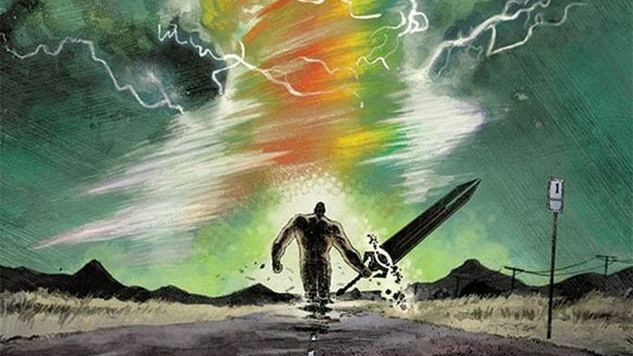 Garth Ennis and Steve Dillon’s classic series about a wayward holy man imbued with the power of a minor deity had a lot to say about Texas and God, two huge entities that also figure into the new Image series God Country, written by Donny Cates and illustrated by Geoff Shaw with colorist Jason Wordie. Cates and Shaw have crafted a take on religion and family that’s personal and compelling, and the first issue is a strong setup for a series that could become yet another Image standout. Opening with an ominous quotation from prose author Cormac McCarthy and featuring narration by what sounds like a southern-fried Nostradamus, this debut issue carries the weight of doom from the start. That doom is personal for protagonist Roy Quinlan, whose father, Emmett, is a mean, crazy old man suffering from what seems to be Alzheimer’s—and who knows what else. Roy refuses to put him in a home, despite the pleadings of his wife and the advice of the local sheriff. The story takes a hard left turn thanks to a tornado, which would appear to bring death, but ends up widening the narrative’s scope. We don’t want to spoil anything, but let’s just say old Emmett Quinlan might have a little more life left in him. He’d better, because there’s conflict a’brewin’ on the cosmic scale. Shaw’s art maintains a dingy quality not unlike that of Mitch Gerads on The Sheriff of Babylon, Jason Latour on Southern Bastards and R.M. Guéra on The Goddamned. But Shaw also brings appropriate majesty to the panoramic beauty of the wide-open spaces of Texas and—mild spoiler alert—outer space. Shaw’s biggest strength, though, might be his facial acting. You can see the sadness, sweetness, wistfulness and pain on all of the characters’ mugs. Despite its larger-than-life scale, God Country feels like a very personal story about sticking by family members, even when all logic would say it’s time to let go. Balancing the down-to-earth elements with the cosmic shenanigans may be tricky as the series progresses, but this is a promising start.